December Spotlights include exceptional artists and skilled athletes. 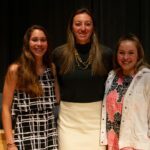 From breathtaking winning goals, to thoughtful printmaking and exceptional reflections, our Students of the Month represent a broad range of talents. Please join us in congratulating the following students for their accomplishments at New Hampton School. 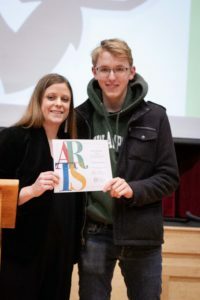 Tristan MacDonald ’20 received the Artist of the Month Award from Faculty member Julie Pereira. 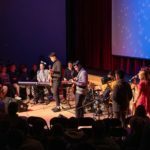 Each month the Visual and Performing Arts Department recognizes a student for their outstanding achievement. For the month of December, they chose to select a student representing the Visual Arts. Julie Pereira presented the Artist of the Month award to Tristan MacDonald. This student in year one of IB Visual Art leads the class with his clear and personal vision as he thoughtfully designs and creates his artworks. Tristan exceeded all expectation as he produced a series of narrative landscape paintings depicting New Hampshire’s White Mountains from the ice age through to the future in five panels. You can actually see this work now in our glass display case by the dining hall. Then, while creating his printmaking piece in December, Tristan worked beyond the required techniques and explored new ones, experimenting with power tools to create subtle effects. He kindly thought to share these techniques with others after school in Art in the Afternoon. His great persistence in the studio led him to get his final print just right. He took the extra effort to then frame his work for our critique. The subject of his work shows his concern for the environment, as he depicted the threatened Loon, which is known as a barometer for Mercury levels in our water. The Loon in his print confronts the viewer with a glaring red eye. You can see this work currently on display in our Art Hallway. He thoughtfully gifted handmade copies of the print to the Loon Society and other organizations. Daily in the classroom, Tristan is also known for lightening the atmosphere with harmless pranks. Yet, he effortlessly shifts modes and offers insightful and constructive advice to his peers. His attention to the steps of the process and his quiet ambition are an inspiration to everyone around, including me, and I look forward to seeing where his artistic practice takes him. The December Writer of the Month was presented to Jordan Bayrooti ’19 by English department head B Cornog. Chair of the English Department B Cornog recognized the Writer of the Month. The month’s recipient is awarded to a student in Mr. Simon’s American Literature and Composition section. 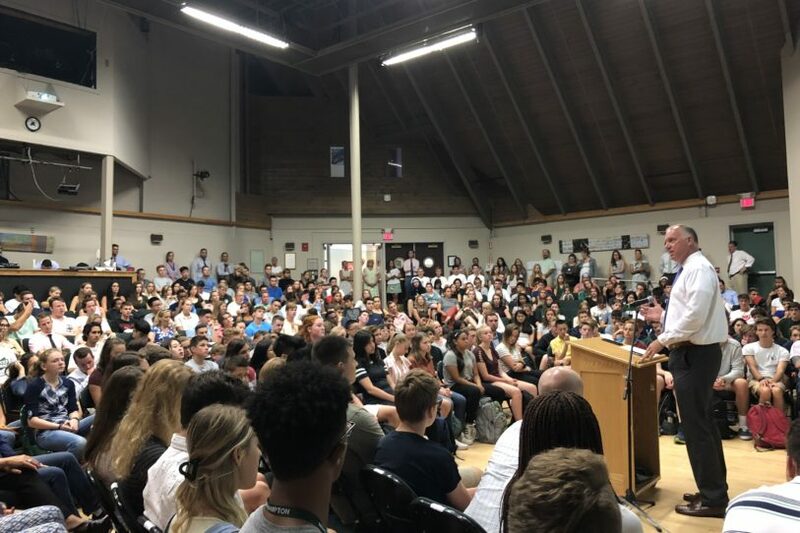 While keeping in mind Ralph Waldo Emerson’s quote, “Do not go where the path may lead, go instead where there is no path and leave a trail,” this student incorporated his comprehension of a wildly controversial movement in the early 19th century known as transcendentalism. 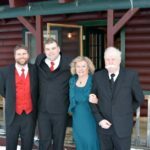 Clear and concise writing techniques enables this talented writer to deliver his ideas seamlessly throughout his writing response. Congratulations to Jordan Bayrooti, our the December Writer of the Month! 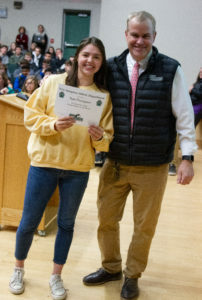 Taze Thompson ’20 was honored with the Female Athlete of the Month award, presented by Director of Athletics Jamie Arsenault. The December Female Athlete of the Month goes to Taze Thompson, a member of the Women’s Varsity Hockey team, for her coachability, work ethic and talent. Taze had an immediate impact in helping the women’s hockey team get out of the gate with a 6-2 start! She scored 11 goals and added 6 assists for 17 points in those 8 games, averaging over 2 points per game. Two of those goals have been game winning goals! She is a great teammate who always brings positive energy to games and practices. Her unselfishness nature in sportsmanship has been huge as she was asked to move positions from Center to Wing; she did so without any hesitation. Taze has been asked to play a lot of tough minutes and really helps the team with an extremely consistent and high compete level! 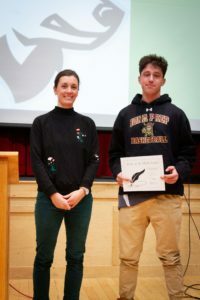 Marcus Joughin ’20 was honored with the Male Athlete of the Month award, presented by Director of Athletics Jamie Arsenault. The December Male Athlete of the Month goes to Marcus Joughin, a member of the Men’s Varsity Hockey team, for his leadership and outstanding performances. Marcus had an outstanding start to the year for the Huskies. He is currently tied for the lead in scoring on the team with 19 points and is top 5 in all of New England prep school hockey. He scored 2 goals including a great short-handed goal against Andover and set up the winning goal in overtime on a great individual play. 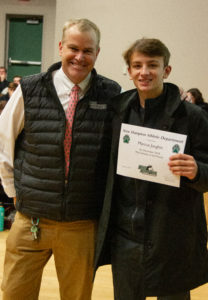 In the Brooks/Pingree Holiday Tournament, Marcus was outstanding in all the games as well as scoring the winning goal in overtime against Brooks. 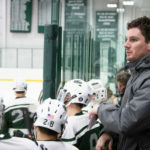 Early in January, at the Nichols/Belmont Hill Tournament, he scored the game tying goal against Rivers with under 1 minute to go, and then added 3 points in the tie with Millbrook–including a highlight reel goal. Marcus currently has 7 goals and 12 assists over the course of 14 games.